Seasoned Rookie with Murph, The Seasoned Rookie. In the upcoming months I would like to introduce you all to some friends of mine. Some of you may have already met, others maybe just seen photos or heard stories in passing but each of them has a story to tell. Each of them has earned the title "Seasoned Rookie" this year at the Zookimelt. Maybe youve heard about the Melt. If you havent, no big deal really. Just a few hundred people meeting out in the middle of nowhere to kick back, relax, and get dirty for a few days. Seasoned Rookie: Hi Brandy, what are some words that come to mind when I ask you to think about Zookimelt? Brandy: Apprehension and the Unknown. Seasoned Rookie: The unknown? How so? Brandy: Well, basically everything was unknown to me all new people, and a sport which I knew nothing about. I take that back about the people I had heard stories about many people that I wanted to meet, but had never met any of them in person. Seasoned Rookie: People you wanted to meet? Like who? Brandy: Well, probably the name I heard the most was Billy Bob, so I was really looking forward to getting to know the man behind all the stories I had heard and pictures I had seen. Seasoned Rookie: How did your expectations match up with reality? Brandy: (laughs) My first impression was "Zany," Just a crazy, fun, great guy just like I had heard. He was funny and very pleasurable to be with. Hes also really great for the newbies, and an excellent driver. I highly recommend him for anyone who has never been on a trail before. Seasoned Rookie: Why is that? Brandy: He was really good about explaining everything that was going on without droning on or talking down to me. As a passenger I heard things like "ok, this hills a little steeper than anything weve done before, so get ready, youre gonna feel that wheel go down about a foot ok now this one" It made me feel very much at ease with what was going on around me and why things were happening instead of just being thrown around the cab not knowing what to expect. Seasoned Rookie: Was there ever a time on the trails when you were even just a little afraid? Brandy: Well, yeah. Maybe not afraid, but overcautious. Our last ride on Saturday Billy Bob and I did the blue trail just for fun we ran it backwards. There was a spot that everyone called "The Stairstep." Billy Bob wanted to test his skills and drive UP where we normally drove DOWN. Now, there was a truck in the last group who tipped over when they tried that. I graciously sat this round out and watched from a safe distance as Doug O. helped navigate that course. Brandy: It was great to see what a small world we were a part of. There was a guy named Sarge who I learned lives only an hour north of me its great that I could just meet people and start talking and realize we all had a lot in common! I dont think I encountered anyone who wasnt helpful or friendly and willing to go out of their way to help anybody. Seasoned Rookie: Would you agree with me when I said that youre generally a shy person around new people? Brandy: Yeah, that would be me! Seasoned Rookie: Then what do you think made the melt so different? Brandy: You know, its really like family, thats the only word for it. There were all these people whom I had never met before; I only spent two days with them. When I left I felt very sad wondering when I could see them all again. Seasoned Rookie: What are some of the memories you have of your first Zukin experience? We covered the people and the trails did you take the wheel at all? Brandy: I got a little taste of driving it was fun. I really thought that I had a good handle on the deal but now I realize that I have so much to learn. 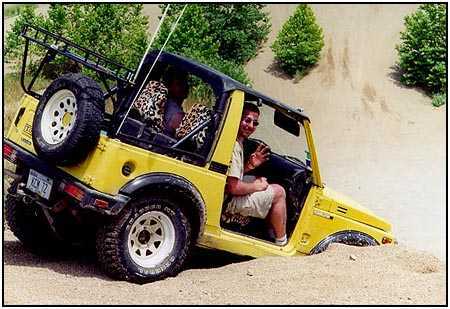 Seasoned Rookie: Im not sure what you mean I remember spotting you going down some of the larger hills on the blue trail and you seemed to know what you were doing, although you were a little nervous about the clutch pedal. Brandy: I pretty much thought, "This is so awesome." Just the freedom of the whole thing. I didnt really drive trails before so I didnt feel I was experienced enough to do it on my own at that point remember, you just tossed me the keys while you were helping spot the other trucks! Just driving around in the quarry and going back and forth to the staging area was fine. A few times I got to lead the group back to the home base and it was fun watching everyone following me as if I knew what I was doing! It was a neat feeling! Seasoned Rookie: I seem to remember you enjoying the night run any thoughts about that experience? Brandy: Ooooh! Things definitely take on a different face at night. The trails you run in the day are indescribable at night. 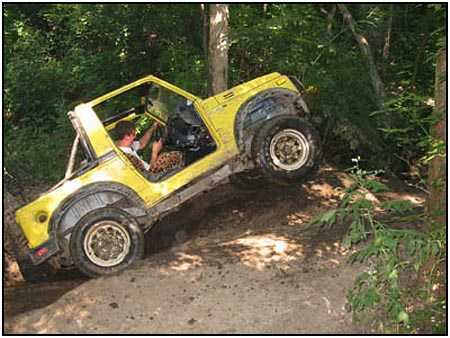 I found that I do prefer day driving better, but I think its something you just have to try at least once at the melt. I think that one of the most important things for a new person at the Melt is to try new things and not be afraid of challenges you are there to conquer. Youre never alone. Seasoned Rookie: How about day to day life since the melt do you see things differently now? Brandy: I think so I find myself taking chances more often. I dont mean anything profound and high risk like bungee jumping, maybe more like willing to try something new in a restaurant that Ive never had before. I realized that I only have one chance to do things and if I pass things by because they are different or Im afraid, you might miss out so you gotta take life by the horns and go for it. I almost have to say the motto that I picked up over the weekend that I heard just about everywhere: "Life is Good."